Moped vs. Scooter vs. Motorcycle: What's the Difference? The difference between mopeds, scooters, and motorcycles comes down to power and size. In reality, all three are actually just types of motorcycles, but they’re built with different purpose and levels of complexity. The simplest way to think of this is to picture three very different breeds of dog and realize they all descended from one original prehistoric ancestor. The moped would be a Chihuahua or Toy Poodle. They’re light, small and serve a simple purpose. They can’t do any real work and aren’t scaring anyone with their low speed, power or small size. The scooter would be the equivalent of a Scottish Terrier or Cocker Spaniel. They’re big enough to be quick, have respectable power to do work like hunt small game and scare off the neighbor’s cat or the mailman when called upon. Originally scooters and mopeds were labeled motorcycles or sometimes “cyclemotors” and developed simultaneously around the turn of the century in the late 1800s. 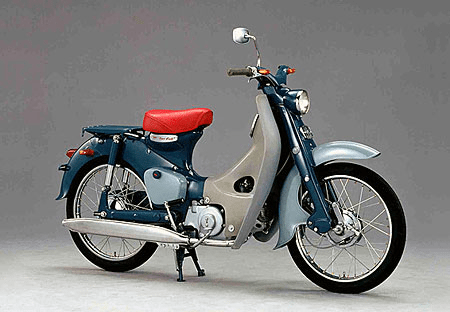 The first mopeds were just bicycles with a 2 stroke engine installed over the front wheel as in the photo above. 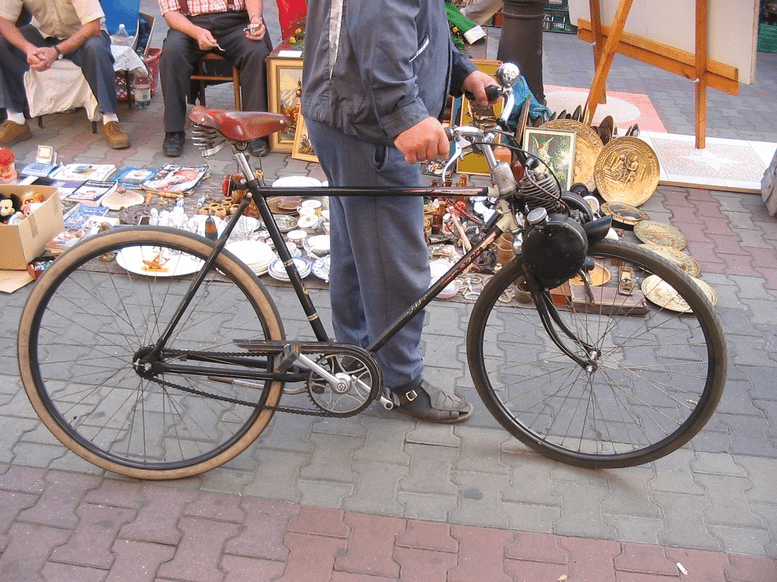 These were the lightest, most economical type of motorcycle by far to purchase and the simplest to maintain and repair. A moped can travel over 200 miles on a tank of fuel. The engine was there to assist leg power instead of doing all the work as is the case with scooters and motorcycles. You had to start the engine running then pedal the bike to the point it was moving fast enough the drive from the engine could be manually engaged with the front wheel. Once that happened you could stop pedaling and the engine would drive the moped along until you hit a hill and you’d have to start pedaling again and possibly disengage the engine drive on steep hills or the engine would stall. That economy-first ideology carried on over time and mopeds became a little more sophisticated. The addition of lights, relocating the engine to the rear wheel or middle of the frame and the introduction of centrifugal clutches inside the pedal housing used to send engine power to the rear wheel. This made it much more user-friendly since pedaling faster would automatically engage engine power to the rear wheel and resistance like on a hill or using the brakes would disengage it. 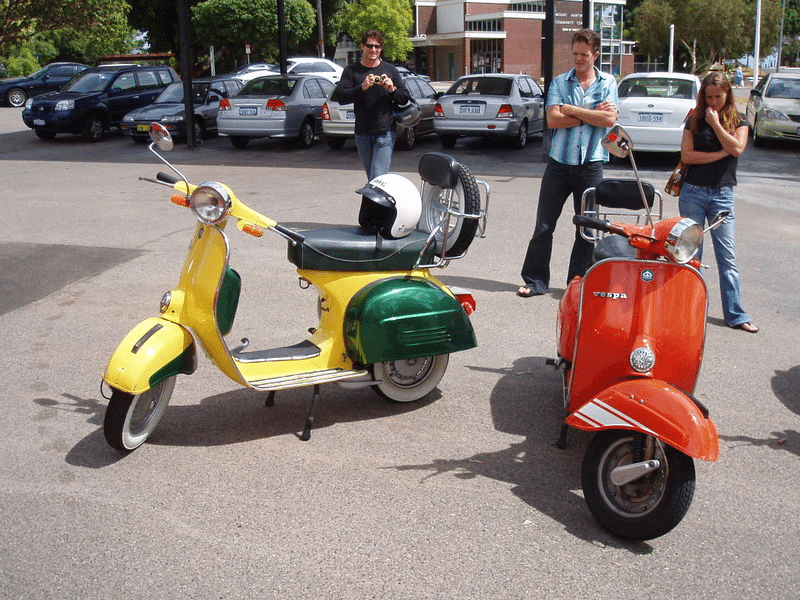 They also began to incorporate the “step through design” to the frame commonly found on scooter designs, making it easier to mount and dismount. They were even built with having a passenger in mind as evidenced by the rear footpegs and the bench seat in the photo below. 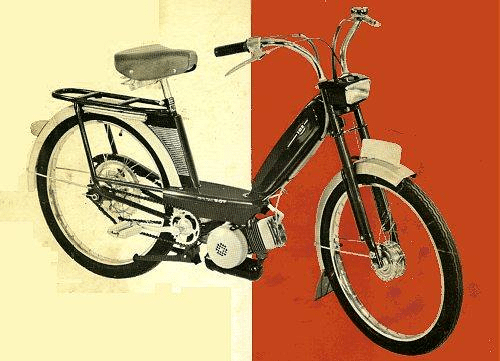 Mopeds didn’t actually acquire that name until it was created in 1952 by Swedish journalist Harald Nielsen by mixing the words “motor” and “pedal” together. 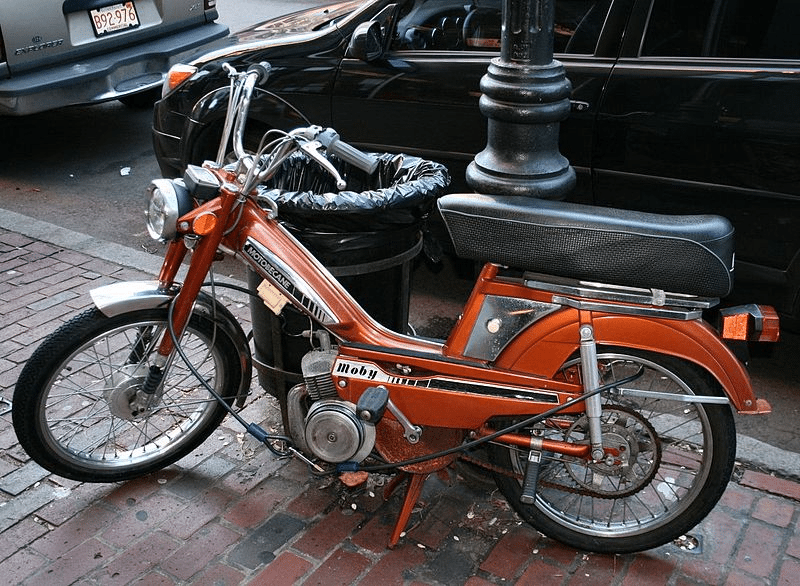 The general modern definition for a moped is any light, two-wheeled motorcycle with an internal combustion engine 50cc or less producing under 2 horsepower. Most still have pedals and require leg power to go up hills, but there are “Nopeds” out there as well that don’t have pedals… which in effect actually makes them low powered scooters. A recent survey in Finland found roughly 80% of mopeds on the road there have had their engines tuned in a way to give them twice the power they should legally be limited to. 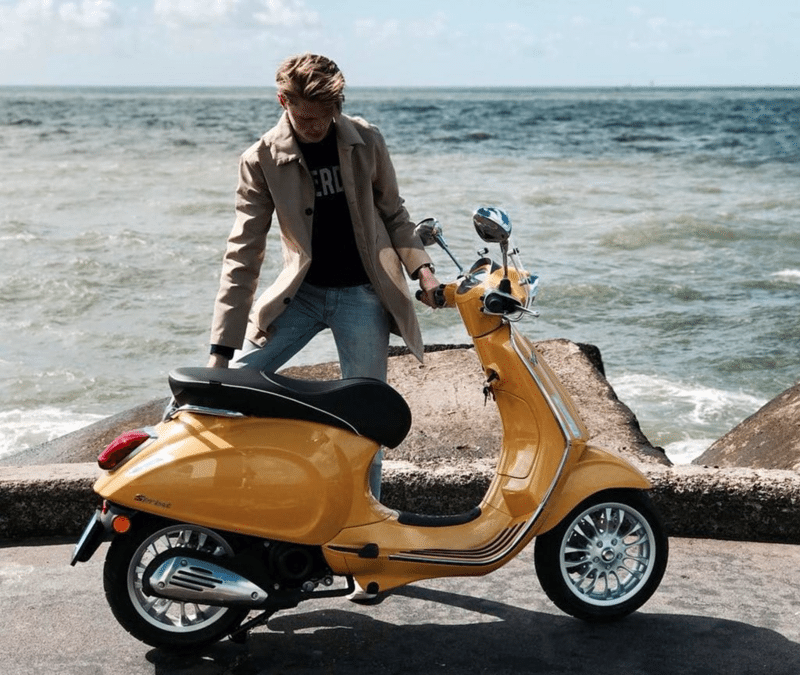 Governments have set up moped use to offer more lenient licensing and insurance rules because they’re supposed to be lower powered, slower and more suitable transportation for teenagers to use. Suping them up like this while fun is bound to get the rules changed for the worse. Just to add to the confusion these days the name moped is often used interchangeably with scooter and in parts of Europe can even refer to micro cars and three-wheeled vehicles. 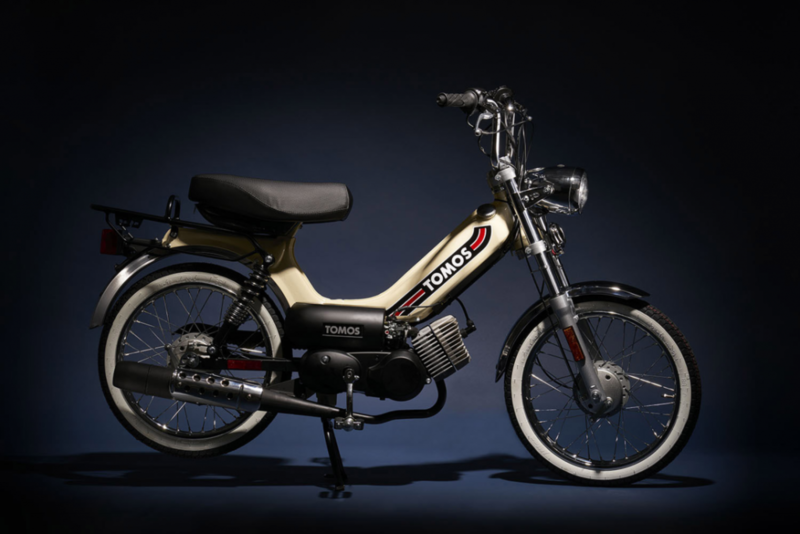 The largest modern dealer of mopeds in the United States is Brooklyn, NY based Tomos America. 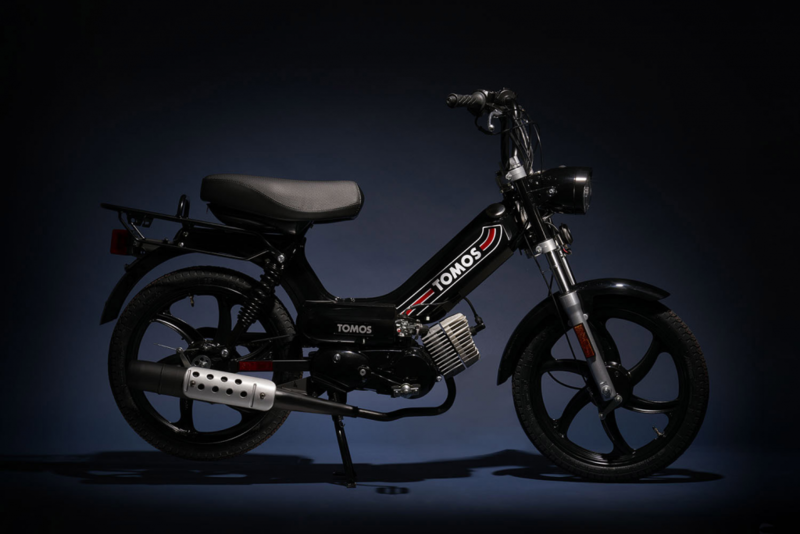 Tomos is a Slovenian company that sells mopeds and E-bikes (electric assist bicycles). 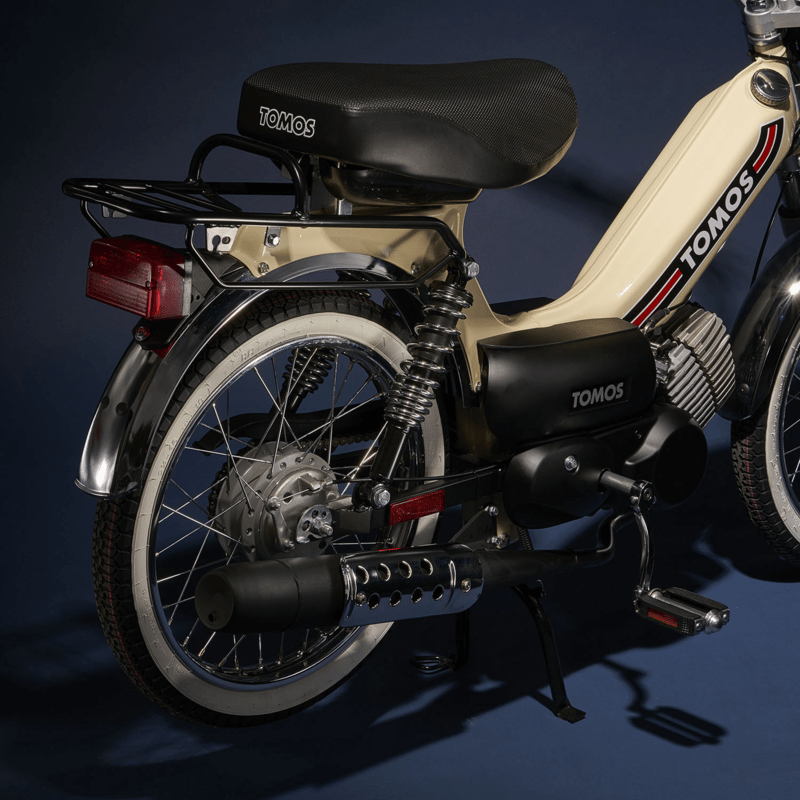 Their two pedal-equipped moped models named the Sprint to come in a chrome, vintage look and a more modern one with mag wheels. Who Should Own a Moped? If you live in a large city like NYC or Los Angeles with heavy traffic and limited parking the moped makes a lot of sense. European and Asian cities are also ideal places to use them for the same reasons. They are most attractive to people on a tight budget who like something a little unusual and getting exercise in their daily commute through the inner city. These would be great vehicles for students in university or college. Wickedly affordable and useful urban jungle craft they are indeed, but they have a very limited carrying capacity and a low top speed unlike my next area of focus: scooters. In the beginning, scooters had manual transmissions and weren’t much different than motorcycles due to the limits of emerging technology. Modern-day scooters are mostly all automatics equipped with Continuously Variable Transmissions (CVT) or something similar. 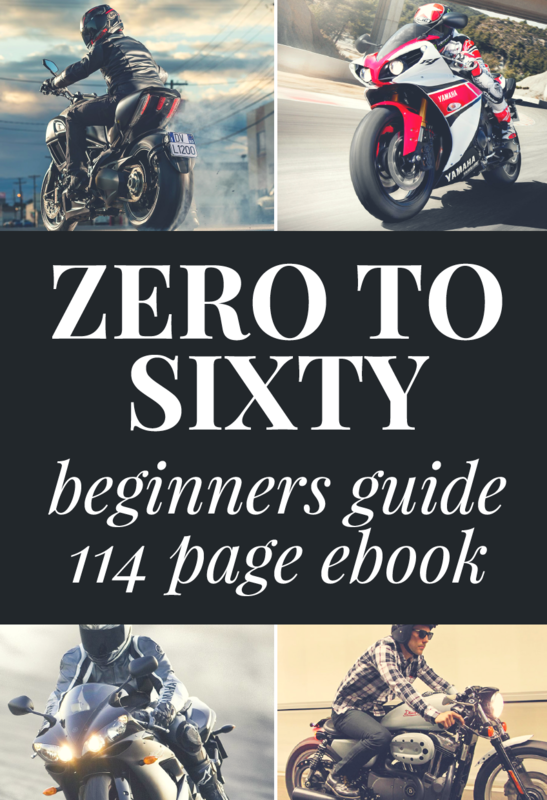 You only need to twist the throttle to produce an infinite number of gear ratios to move the scooter smoothly and quickly. 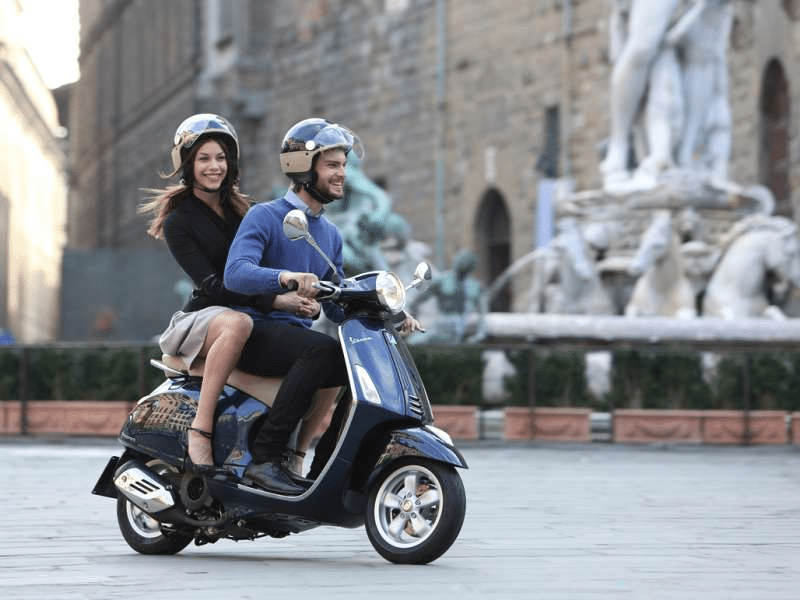 Scooters share all the positive traits of mopeds and none of the drawbacks. 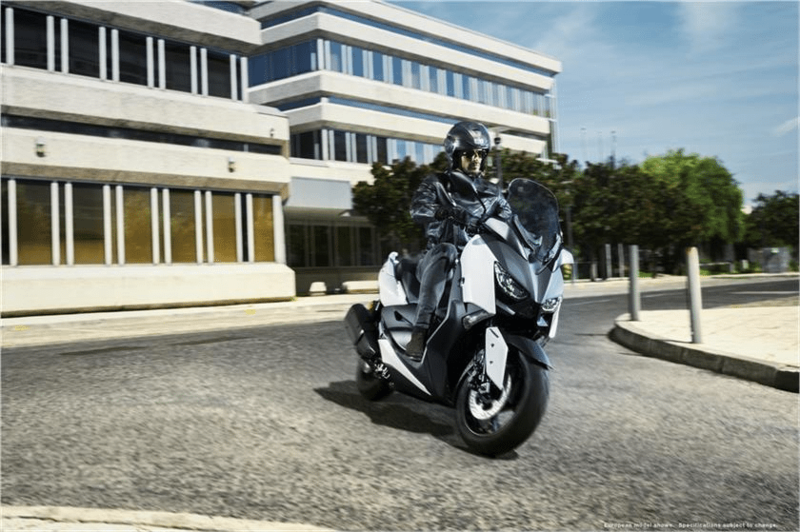 They’re very fuel efficient, lightweight and easy to drive, but unlike mopeds, plenty of them have larger engines ranging from 50cc all the way up to 850cc. Before we delve right into new models, let’s take a quick look at the origin of this species. As mentioned before, scooters evolved concurrent with mopeds and motorcycles but took a cleaner and more aerodynamic path when it came to their appearance. Scooter builders favored smooth curves and futuristic, space-age styling. 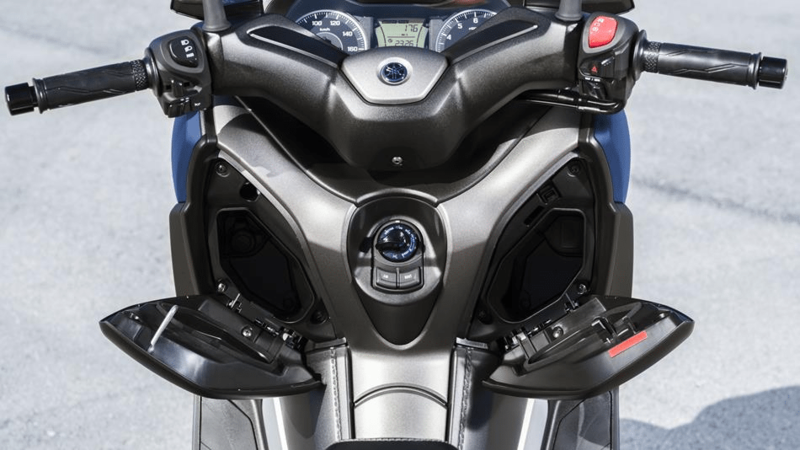 The design allowed for comfortable seats along with some protection from the elements thanks to wings that stick out from each side of the front acting like a fairing does on a touring motorcycle. 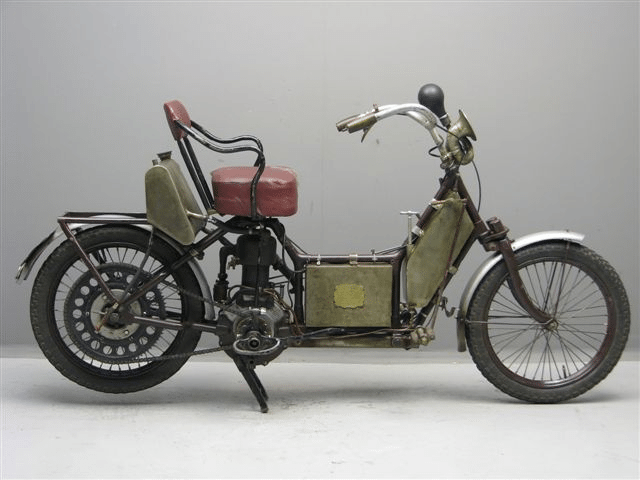 The photo above is the 1908 Auto-Fauteuil which arguably is the prehistoric ancestor of the modern scooter we are familiar with. It has the step-through design and more of a bench type seat on it than most motorcycles would. It was in production for 20 years and was called a motorcycle though. Generally speaking, scooters weren’t reliable or popular until after the Second World War when former aircraft manufacturers embraced them as a new product to mass produce. Building stamped tin frames and body panels came naturally to aircraft builders and many high-quality scooter factories started building them in the US, Italy, Germany, and Japan in 1946. 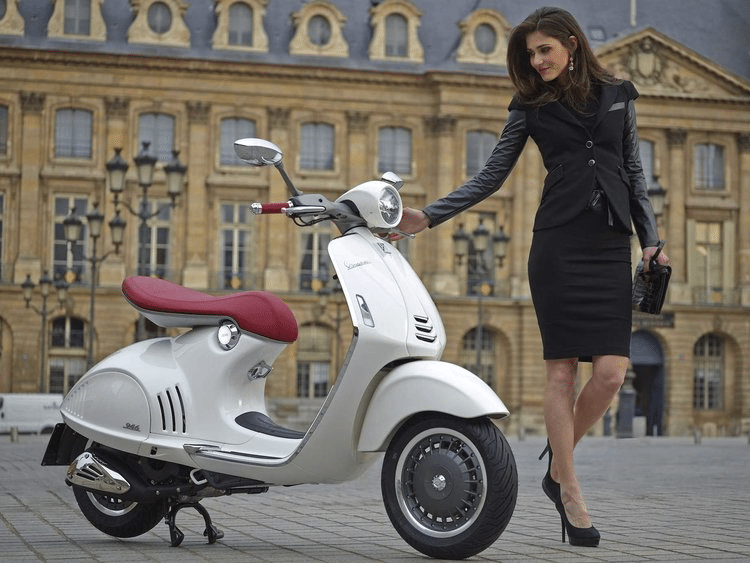 One of the most popular scooter building companies is the Italian maker Vespa. 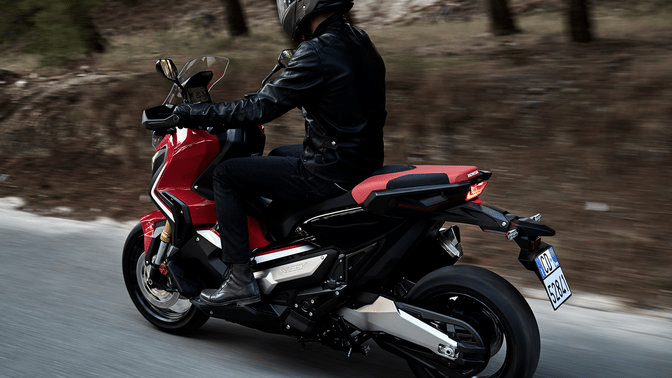 The name means “Wasp” in Italian and was coined by the company founder Enrico Piaggio when he first laid eyes on the prototype design for the original MP6 in 1946. The back end of the scooter tapers to a stinger-like point which I suppose does look a bit like a wasp’s abdomen. From the 1940s to the 1970s scooters were just as fast as motorcycles and even beat them regularly in racing circuits. 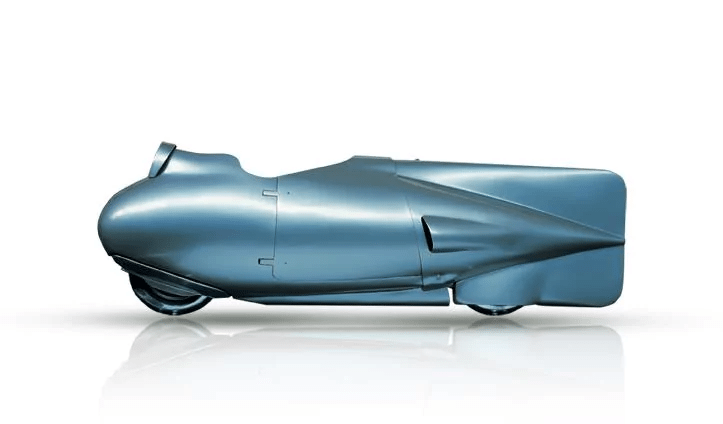 Have a look at this photo below of the 1951 Vespa Siluro (Torpedo) that set a record in the Flying Kilometre race by maintaining an average speed of 106 mph! It only had a two-cylinder engine producing a maximum 17.2 hp, but that was really powerful for the time. In the 70s motorcycle technology advances put them ahead of scooters to stay, but for a while there it was a racing scooter heyday. Racing definitely wasn’t the scooter’s ideal niche to fill. It was and still is best suited to moving people around in congested cities anywhere in the world. Motorcycle sales can’t touch scooter sales across the globe, mainly because they are used so heavily in densely populated Asian countries like India, Thailand, and China. 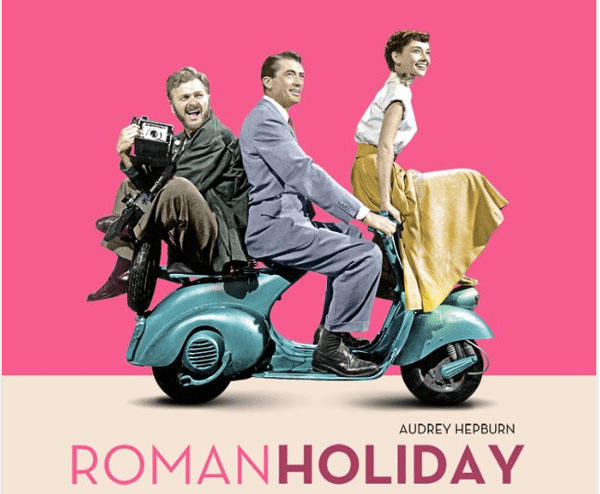 In 1953 Vespa made a big splash in the US and international market thanks to the hit movie Roman Holiday where Audrey Hepburn rode around Rome on one their scooters with Gregory Peck. That moment on the silver screen made their bikes super chic and cemented them as the first internationally successful scooter company. To this day Vespa scooters have a hugely romantic draw about them. 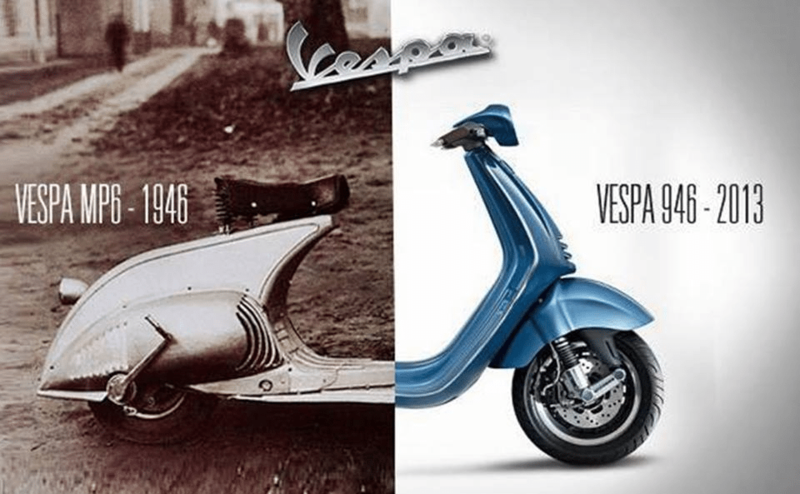 Vespa’s success opened the door for another major scooter builder to dominate 3 years later. 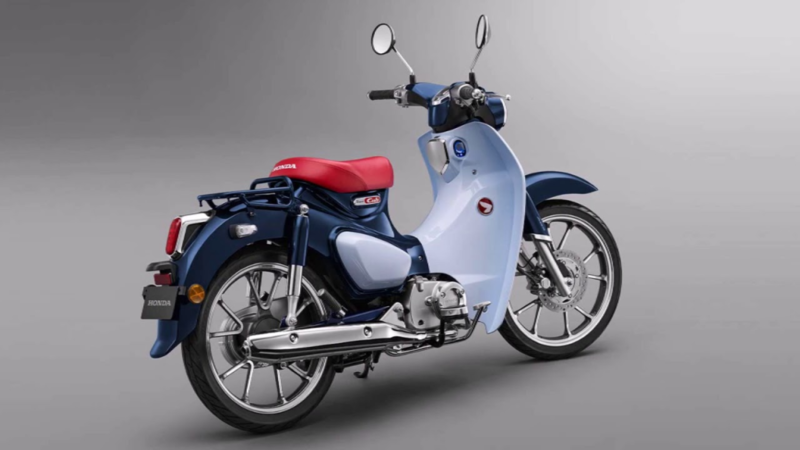 I tend to think of Honda as a major car and motorcycle company, but in 2008 they sold their 60 millionth Super Cub scooter in just 50 years of production across 160 countries! They sell for about $1400 USD new and are so tough and reliable they are used in Asia as a packhorse regularly. How reliable and tough are these scooters? Charlie Boorman decided to torture test one by removing the engine oil and replacing it with dirty cooking oil from a chip fryer, overloading it with pizza, fruit, and vegetables and riding it around to see if it would die. It didn’t. He then pushed it off a building roof onto the parking lot below and it still started and ran. Skip to the 2:30 mark to see the test yourself. Rumour has it an electric version is going into production in 2018. Here a photo of the concept model unveiled by Honda in 2009. 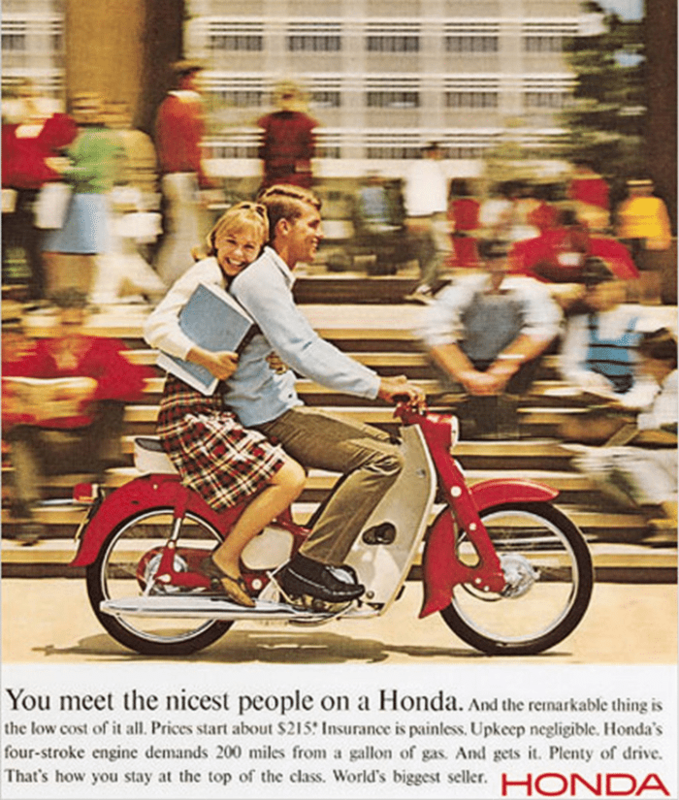 The introduction of the Honda Cub in the US back in 1958 was a huge success in large part due to its advertising campaign which made motorcycling look tame and friendly instead of linked to gangs like the Hells Angels as it was then portrayed too often. There have been some rumblings in the scooter class of motorcycle in recent years by companies like BMW, Yamaha, and Honda, making me wonder if they’ll maybe make bigger inroads in North America. 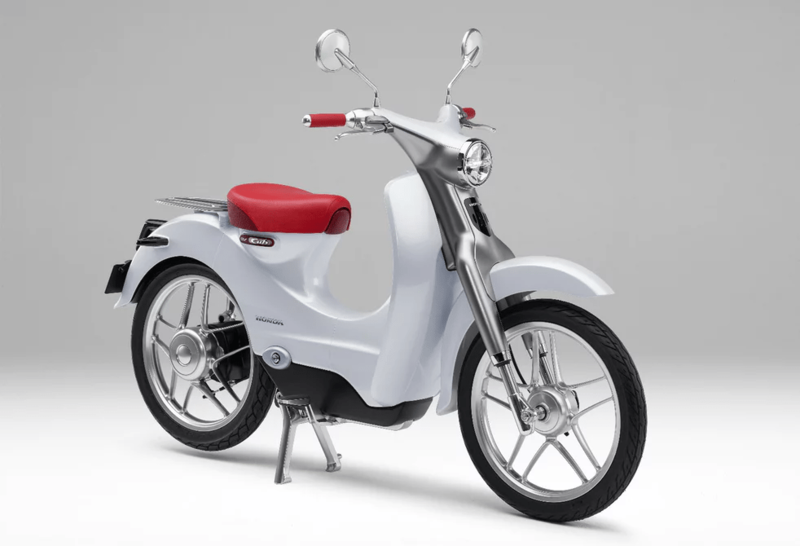 All of them build the most popular kinds of small scooters with 50 to 120cc engines in them, but the trend now is towards larger displacement four-stroke engines and much bigger, heavier body and frame assemblies. Scooters are suddenly seriously fancy and fast again. They’re being labeled Maxi Scooters. Even though they’re heavier the center of gravity is built low down and they don’t feel heavy to ride. Does this look like what you picture in your mind when someone says the word scooter? A 397 lb machine with ABS and Traction Control technology that easily roars around town with two people on board? It has a huge storage compartment under the seat for two helmets with room to spare. The XMAX has been released into the US market for the first time in 2018 and reviews so far are positive about its power and handling. It’s been described as FUN and easy to ride. Couple that with Yamaha reliability and it’s a sure winner. Yes, you read that right: Adventure Scooter! 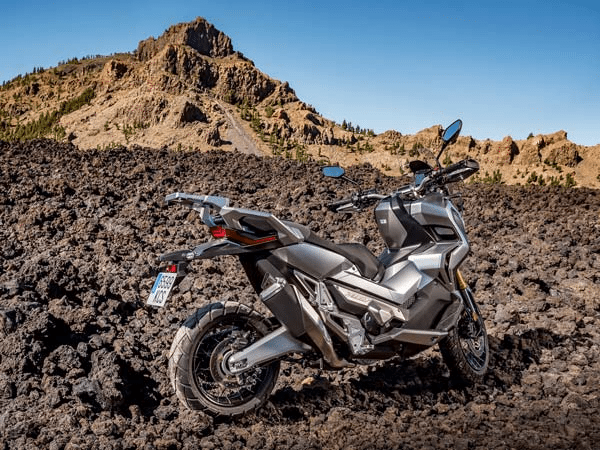 For those who are vertically challenged but still want to ride off-road it can be difficult to find a dual-sport motorcycle low enough to the ground to reach comfortably. 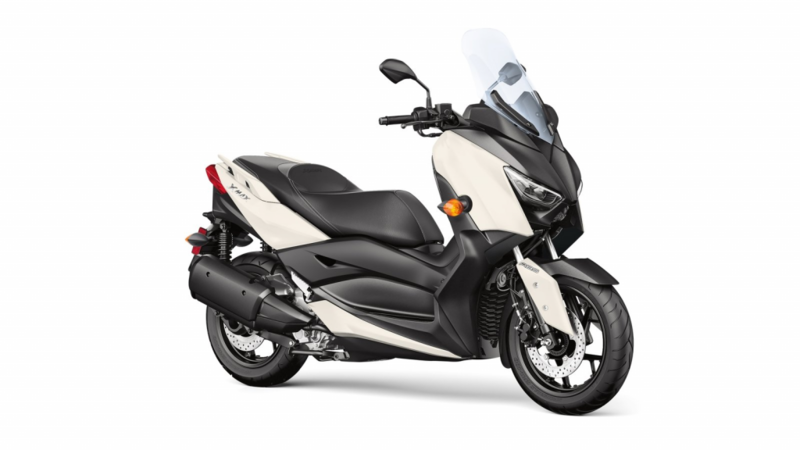 This new Honda scooter will take care of that problem as it has the step-through design and a low seat height. This is absolutely the coolest scooter ever built. 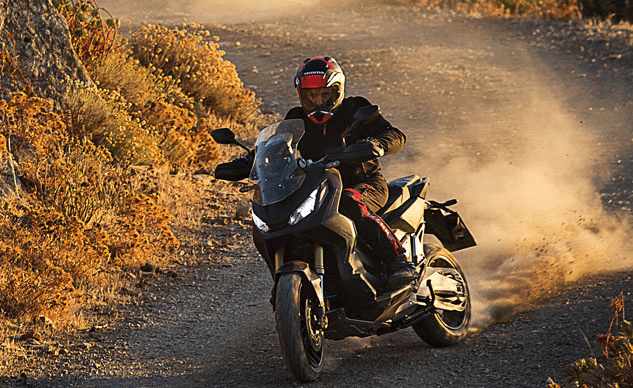 It has Pro-Link adjustable preload on the rear suspension which should handle rough roads quite well and the same bulletproof engine as is in the NC750X. 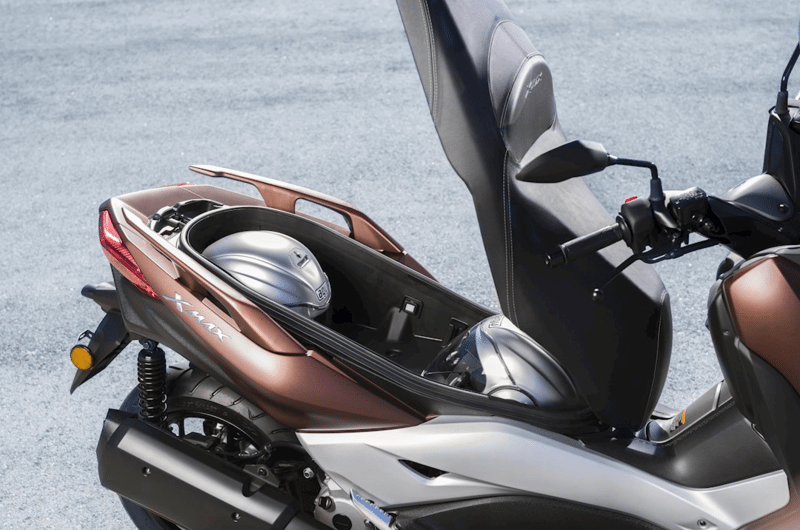 Much like the NC750X this scooter has the lockable “frunk” under seat storage compartment big enough to house a full face helmet too. What it doesn’t have is a CVT drive system, instead, it has a chain final drive and Dual Clutch Transmission which is way better and stronger than a CVT system would be off-road. I would really love to try one of these out but, unfortunately, they won’t be available in North America in 2018. Maybe next year we’ll get to try it on this side of the pond.